Today I not only wanted to share Finn's birth announcement, but also a little about why we still follow this somewhat dated tradition. I'm still pretty old fashion when it comes to many things, particularly with Christmas Card & Birth Announcements. First off, I absolutely love receiving them! They immediately go up on our fridge, so I can see the sweet faces of my friends & family on a daily basis. Having lived far away from home for over 7 years now, I don't often get to see all my loved ones that often. But getting those cards in the mail puts a huge smile on my face & makes me feel a bit closer to them. Now many would argue that with social media, there really is no need for the formal announcement. I couldn't disagree more! Various pictures are constantly popping up on our feeds, sometimes rarely getting more than a glance. And aside from that, it is a completely different experience to hold & touch a photo as opposed to seeing it on the screen. And far more effort & thought is put into the design of an announcement & addressing of the envelopes. I don't want to miss out on those experiences. I want Liam & Finn to always have pictures of family & friends to look at throughout our house, not simply on a screen. So yes, everyone already knows that Finn was born. They know he is a boy, they know his name, they most likely have already heard his birth stats. And more than likely they have already seen plenty of pictures of him. But my hope is that his announcement was still received with a bit of joy. That those people know they are important to our family & we are excited to share our new addition with them! And of course now that I've said all this, surely someone was accidentally left off the list or I didn't have their correct address. What has happened to the "We've moved..." card. It is nearly impossible to keep my address book up to date these days! I find myself going through my book every Christmas and asking myself "Did so & so move? Do we have the new address?" Frustrating people, very frustrating! Now the rambling is over, & here is the announcement we mailed out! I love the sweet & simple design from westwillow. Couldn't agree more!!!! We are doing them, too! Love his announcement! I love the concept of still doing a birth announcement and his is adorable! I loooove the announcement! We did these for Mia and totally plan on doing them for baby boy as well! I love the announcements you picked and I completely agree that they are totally still necessary! Like you said, statuses and photos on social media get lost in the shuffle and in the masses of chatter. I can't wait to send one for our next baby boy! 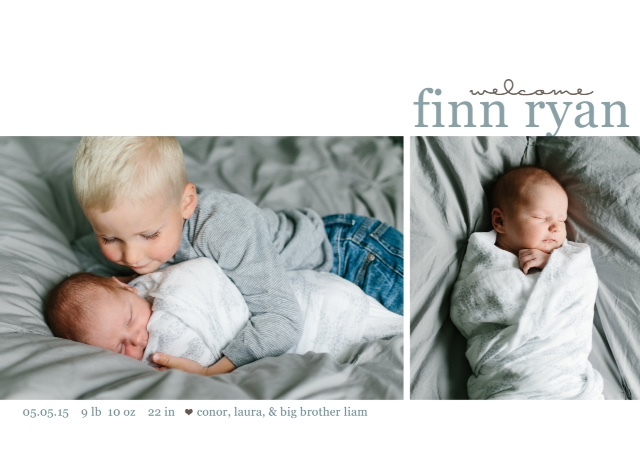 Welcome, Finn! Love it! So simple, but beautiful. I agree with you. I love getting this kind of mail! I love birth announcements too! I always put them on my fridge, but no one I've known has had a baby recently, so no new pictures are up. I love writing letters too, but most of my family prefers email over that. I love receiving birth announcements and often look at cards thinking of the day I get to send them out :)! I love the font and simplicity of your announcement, so sweet and simple.